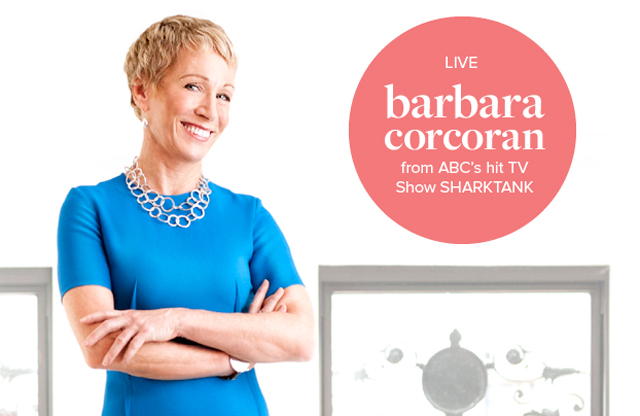 You probably know Corcoran from her regular appearances on Shark Tank. What you might not know is she built a real estate empire, the Corcoran Group, into a powerhouse and sold it for $66 million in 2001. She is, and always has been, a huge proponent of staging. So why isn’t everyone? It’s a mystery to me. As a stager, educator, and writer I continually talk and write about the advantages of home staging. It’s a no brainer. In a recent staging class, I teach for Realtors, a hand shot up. Realtors and sellers seem to be getting the message. 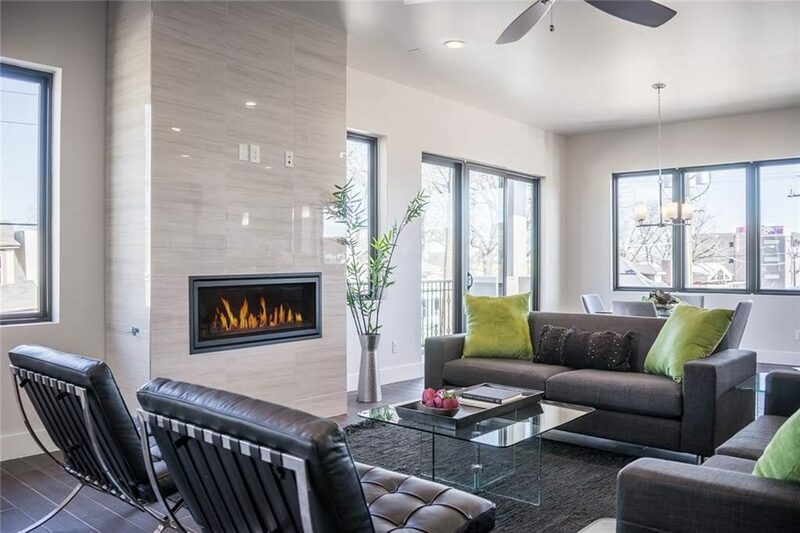 The National Association of Realtors released their 2019 Profile on Home Staging recently and a whopping 83 percent of buyers’ agents say staging makes it easier for buyers to visualize a property as their future home. This figure was up from 77 percent in 2017. The profile is only released every two years, and this is just the third time it’s ever been done. 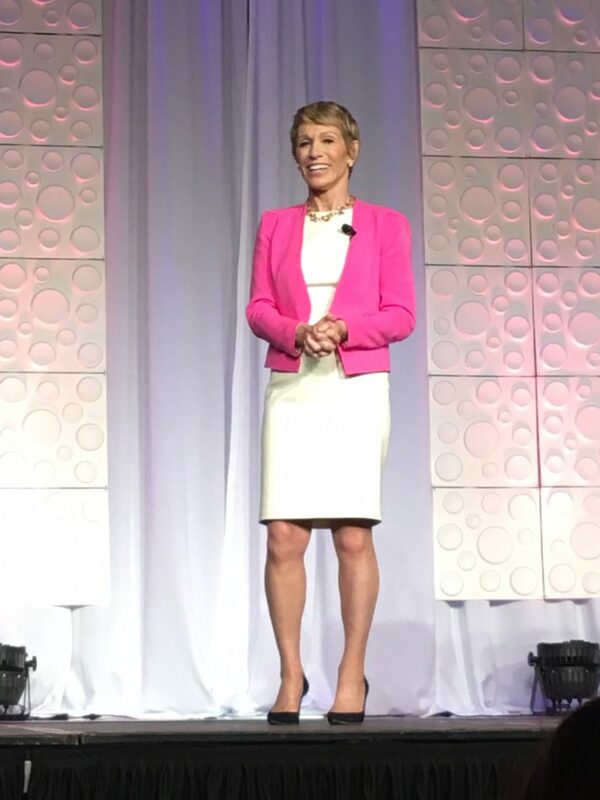 “Shark Tank” star Barbara Corcoran shares her rags to riches story with more than 1,200 attendees at the Champions School of Real Estate Keynote 2016. Full disclosure: I am not a morning person. The fact that I obligated myself to head out to the Plano Centre at 8:30 a.m. to see legendary real estate broker and reality TV star Barbara Corcoran is on par with a visit from the Pope for us here at CandysDirt.com, so of course I put myself together for the early morning event. And people, it did not disappoint. The event, put on by Champions School of Real Estate, brought in Corcoran for their signature event, drawing a crowd of more than 1,200 real estate professionals from around the Dallas-Fort Worth area. But it didn’t just highlight Corcoran’s inspiring story and wicked sense of humor, it also showed how far Champions School of Real Estate has become a powerhouse in the industry. There are a lot of great stories in the real estate industry, but none are quite as compelling as “Shark Tank” star Barbara Corcoran‘s. The New York real estate mogul came from humble beginnings, building up her empire with just a $1,000 loan and an incredible amount of hustle. And we could not be more thrilled about seeing Corcoran at the Champions School of Real Estate Keynote 2016. The May 10 event will host an inspiring address from Corcoran at the Plano Centre, gathering more than 1,200 real estate professionals and influencers all in one space. After Corcoran’s presentation, Champions School of Real Estate CEO and founder Rita Santamaria will host a lively Q&A with this titan of our industry. It’s truly a can’t miss event! Tickets are available at a rate of $65 per person or $480 for a group of 8. To register or learn more about Champions School of Real Estate’s Keynote 2016 visit http://www.championsschool.com/keynote/dallas.php. When you talk about the dream that gets people into real estate, it often follows the arc of Barbara Corcoran’s story. She worked 22 different jobs before getting a $1,000 loan from her boyfriend and starting a fledgling real estate office in New York City. More than $5 billion later, Corcoran is a well-known entrepreneur and stars along with Mavericks owner Mark Cuban in ABC’s hit reality show Shark Tank. The Corcoran Group is what made Barbara her fortune, but she couldn’t have done it without an iron will and fearlessness for which she is admired. If you find yourself gearing up for 2016 and looking for the right motivation to build your real estate business into a universal brand, then you don’t want to miss Barbara Corcoran’s “Rags to Riches” keynote May 10 at the Plano Centre. You can purchase sponsorships, as well as group and individual tickets, through Champions School of Real Estate today. Don’t wait because this will likely sell out! I think I’m going to challenge Barbara Corcoran to top this one. Let me tell you, there is no way. I emailed this home to my daughter and she was hooked! 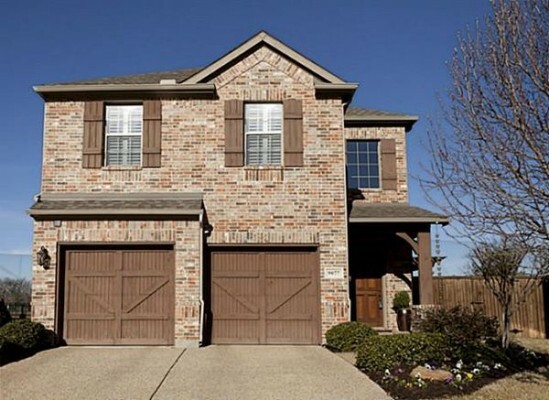 This is a new home at 9077 Cotton Village Drive, just built in 2006, with three bedrooms, two and a half baths, upstairs gameroom, great granite and stainless kitchen, open floor plan and high ceilings! 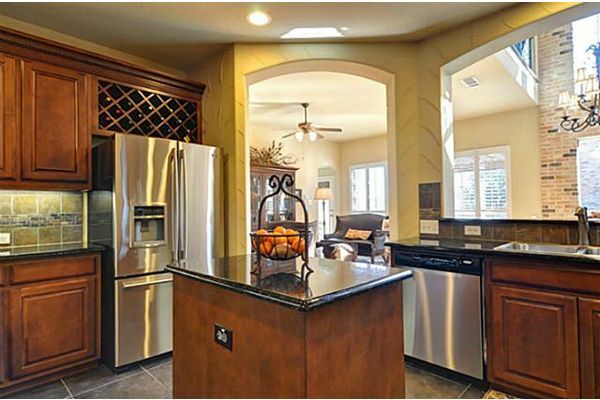 Not only is it fresh, saucy and beautiful, it’s in a gated community on a golf course and is a golf lovers dream! Countless upgrades include: granite in kitchen and master bath, solid oak hardwood flooring, plantation shutters, stainless steel appliances. I am loving that exposed brick wall. The master suite — yes, suite with separate shower and jetted tub — is down. 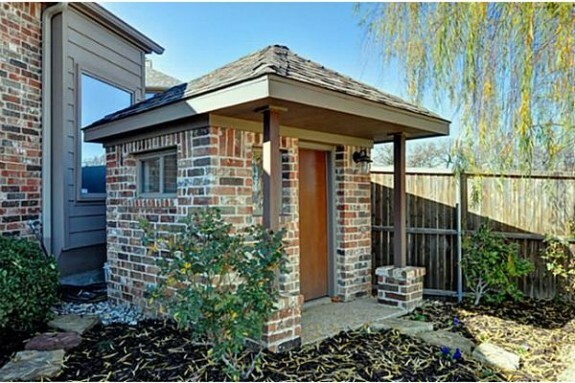 Here’s a plus: you get a custom built playhouse with doggie door in the professionally landscaped backyard. Could be extra storage, a house for Rover in winter, or an actual playhouse. There is also a pergola patio. The only drawback my daughter saw (for her) was the location: Fort Worth. 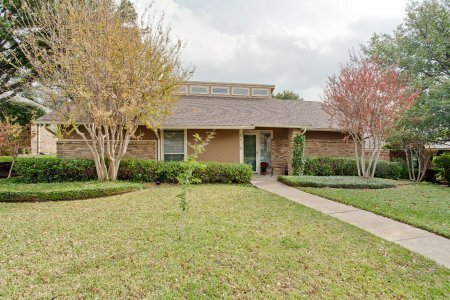 Big deal: this home is seconds from I-30, and I challenge Dallas to find a home with all these goodies jam-packed in Dallas County for $259,000. In fact, I double dare you! 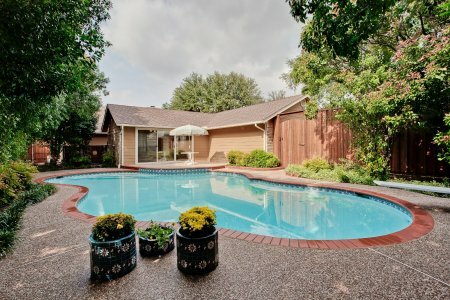 Now here’s a great ad for Dallas real estate — Barbara Corcoran, listen up: where else in the world can you get more than 2000 square feet, three bedrooms, two baths, updated everything plus a sparkling pool in the back yard? Look to Moss Haven, young man, Moss Haven and 8414 Flower Meadow. 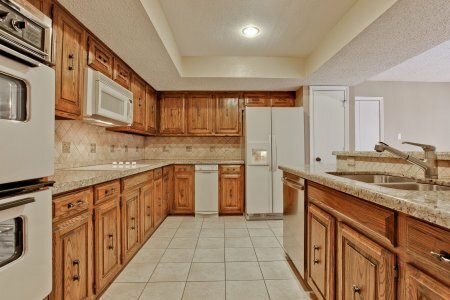 Floors have been updated to wood, granite has been chiseled into the large kitchen, and forget the bar cart — you have a real wet bar! 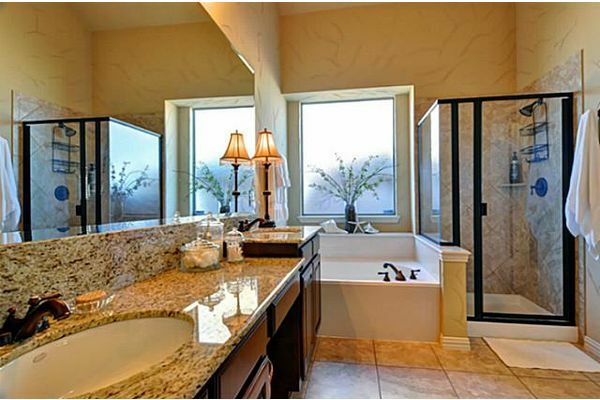 Then go into the 16 by 13 foot master suite and you will find dual sinks, a large walk-in closet, separate bath & shower. This brick home was built in 1979 and is in the Richardson ISD. You get two living areas and unlike the cottages in the M Streets, this home has a cathedral ceiling with transoms in the great room that let’s the light shine in. (Cathedral ceilings are very 1970’s, and hot au currant.) Like to entertain? You will love the outdoor courtyard accessible by master, dining, and family rooms. Or just hang around the pool. All this plus a street with a cute name for $249,000? Click on over to Natalie Patten, Dave Perry-Miller In-Town, and do not stop to Christmas shop along the way to see this house: it will be gonesville. 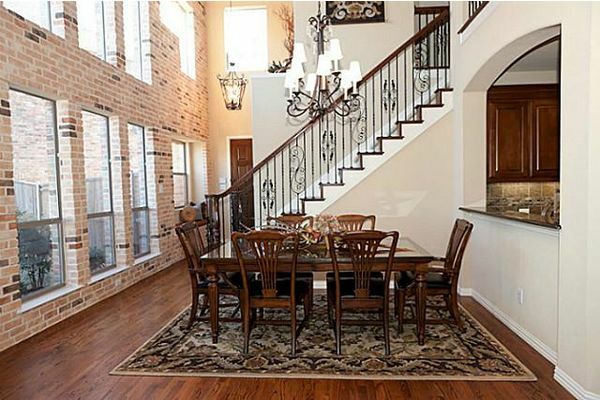 I LOVE Dallas real estate, and this house is one reason why.